All are welcome to join us and you don’t need to be an Amnesty International member. On Tuesday evening our supporters signed 187 letters at Greenwich Picturehouse. Also, this week we saw the release on bail of the British-Iranian Ghoncheh Ghavami who was jailed for watching a men’s volleyball match. We took action on the case and it shows that letter writing makes a difference. Thanks everyone! It’s our regular letter signing drop-in tomorrow from 8-9 at Greenwich Picturehouse. 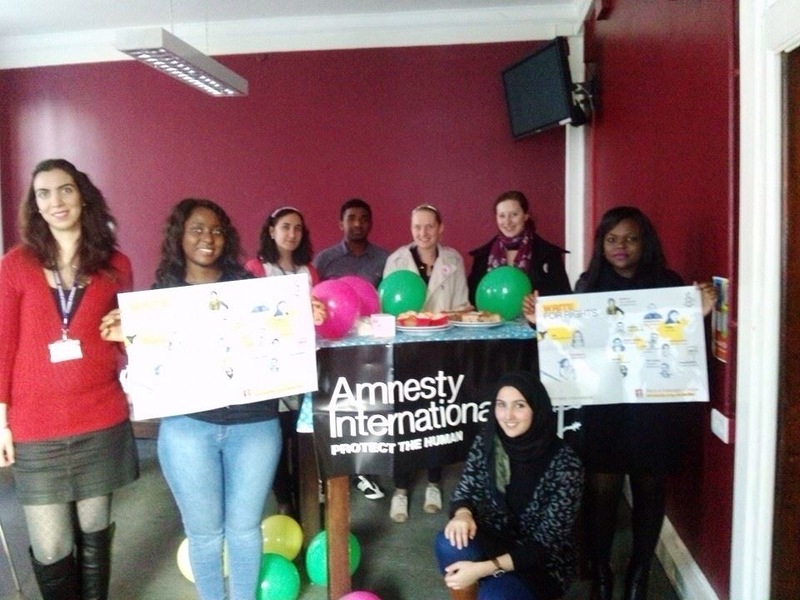 The Amnesty Society at University of Greenwich have raised £41 through an AmnesTea event. Well done guys! AFRIL have contacted us they have 12 destitute families in Lewisham and urgently need donations of food and clothes. I am delighted to announce that yesterday’s book sale raised £2984.12 for Amnesty UK’s human rights work. To achieve this our many volunteers have worked for many weeks planning and promoting the event. In addition there are a lot of people online and offline from the local community who have supported us. And then on the day our amazing customers came out in their hundreds to buy books and take action on children’s rights too. A big thanks to everyone who contributed to making the event a success. We really appreciate your support. Looking forward to our next sale in June 2015 already! All books left in the Church of the Ascension are available to take for free from 4pm. Please help us to find a great home for them by taking what you can. Thanks for your support!